New GE Breakthrough: 100 DVDs on 1 Disc! Okay, here’s a quick question: how many DVDs do you own? If you have less than 100, then there is now a way to put them all onto one disc. It would appear that General Electric is the one who is responsible for this technological breakthrough. The company who has been “bringing good things to life” have used holograms to make this good thing a reality. This could eventually lead to micro-holographic players that could play CDs, DVDs, Blu-rays, and these cool holographic discs. These discs could hold 500 GB of memory, and it is possible to produce these holographic discs at 10 cents per gigabyte. That is a lot cheaper than the $1 a gigabyte for a 25 gigabyte disc. 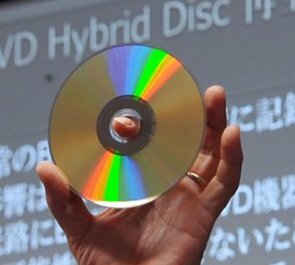 As I said before, these micro-holograms can create a capacity of putting 100 average DVDs on one disc, and it is possible to put 20 Blu-rays discs on one. These jam-packed holographic discs will come in handy when it comes to high resolution formats like 3-D television, which is getting bigger everyday. I hope that the Research and Development at GE are celebrating the six years of work to make this revolutionary technology. Of course, it will probably take a while before the consumer can get their hands on it, and even longer before it is cheap.